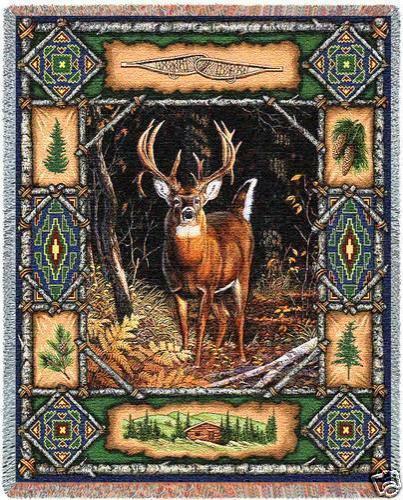 "Buck Deer Lodge Throw" This lodge inspired throw has lovely warm browns and greens. A staunch and proud buck stands on the lookout. He surrounded by rustic images of cabins, pine cones, and snow shoes flanked by a tree bark border. This is a great gift for the deer or wildlife enthusiast! Cotton blend. Woven on Jacquard looms. Measures 54" Wide x 70" Long. PLEASE NOTE: Shipping ONLY within the continental U.S. Hawaii, Alaska, and Puerto Rico residents must contact seller for shipping quote before ordering.